Flashes in the Dark - Family Times is an award-winning magazine with staff-written news, feature stories and artwork that inform and inspire Central New York parents and their children. 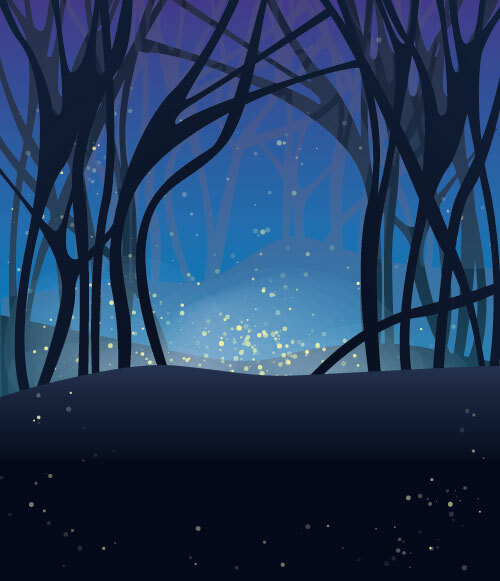 Jaye and Em know where the fireflies live. Ask them, and my daughters will tell you: under the cedar trees where the myrtle’s so dense you can’t see the forest floor beneath. Ask when they come out, and my daughters will say: when the twilight’s so deep you can hardly make out individual trunks. When a fine mist rises at ground level, adding to the mystery and magic of the fey, blinking lights. That’s where the fireflies live. That’s when they come out. But you won’t ask, because grown-ups aren’t supposed to be interested in fireflies. Our fascination with lightning bugs supposedly ends when we learn the science behind the luminescence; the biology of why they blink and glow when other insects don’t; and the reality that they aren’t magic after all. My family proves these suppositions wrong. At ages 22 and 24, Em and Jaye are grown-ups. The driveway they once decorated with sidewalk chalk is now home to their cars. Beyond the blacktop and the sparse grass of the side lawn, the cedars hold court. On humid summer nights I witness one daughter or the other pull up in her car, get out, pause, and scan the growing darkness, hoping for a glimpse of magic. And on nights when they’re not out there, I am. According to Kristian Demary, a biologist with the Boston Museum of Science, most flashing species of fireflies in the Northeast come out between Memorial Day and Labor Day. When my family first moved into this cedar-shaded colonial house two decades ago, it was early September—too late for firefly season. We had to wait nine months to see if our wooded hilltop neighborhood had the right combination of trees, moisture and grassy areas to create the ideal habitat. My memory isn’t reliable anymore; it blinks on and off like a firefly attracting a mate. I can’t share the details of that first sighting because there were so many others through the days, weeks and months of firefly season. I remember that the woods behind the house came alive with pulses of light just at the moment it seemed too dark, too late to expect anything. The girls danced in the dim twilight, cupping their hands and swiping at flashes. Jaye thrust her arm out to show me a streak of faint but steady light smeared across her skin. Once I explained it was a smushed bug and that the glow wouldn’t last, she grew somber and vowed not to hurt any others. We weren’t completely innocent of any crimes against nature. We ran outside with jars just like generations of kids and parents before us. But we only imprisoned our fireflies for a short while. We tried to be considerate jailers; we punched holes in the lid, placed a piece of damp paper towel at the bottom of the jar, added a handful of grass. Before we went inside and upstairs to bed, we always set them free. The first flakes of snow often delight us; but by the time we see three feet on the ground the charm has melted away. Not so with fireflies. The girls and I could never get enough of that serendipitous, intermittent concert of pale color—those pinpoints of light blossoming, then fading into the dark, all within the span of an hour. Firefly season seemed to grow shorter the older my daughters got. When Jaye went away to college, she emailed me a Pinterest link featuring faux fireflies in a jar. The instructions call for a clear glass vessel, three glow sticks and glitter. After snapping and activating the glow sticks, you snip off one end, squeeze the contents into a jar, add a touch of glitter, and voila! The end result as shown online looks too vivid not to have been Photoshopped, but it’s a cruelty-free option worth exploring. Over the years, the backwoods have thinned. The violent Labor Day storm of 1998 knocked down some trees. Others fell when new neighbors clear-cut their land to install an in-ground pool. Still more trees were lost when one property owner decided a lawn would look nicer than brushwood. We don’t see any fireflies back there anymore. Maybe it’s too open, too dry. Or maybe it’s due to the dwindling firefly population, occurring not just in our neighborhood but around the world according to Firefly.org. But still, our side yard remains a reliable habitat. Between the dense growth of myrtle, the decomposing logs hidden beneath their glossy leaves, and the cooler northern exposure, there’s plenty of moisture and organic matter for the grub stage of the firefly’s life cycle, which lasts up to two years. The fact that the flying insects only glow during the last two weeks of their lives makes their beauty even more poignant. I stand just at the edge of the trees, looking for twinkling bursts of light moving low to the ground or floating up into the trees. When I spot them, I call Em over to watch them with me, and Jaye, too, if she’s home for a visit. Our unfailing awe and wonder is proof that we’re never too old for fireflies. So ask us where they live. Better yet, come over and watch them with us. Summer may be short, and firefly season even shorter, but as long as the fall of night is heralded by those darting, glowing creatures just outside my door, I continue to believe. Magic is real. Anything is possible. Linda Lowen teaches at the Downtown Writer’s Center and is co-producer and co-host of Take Care, a health and wellness radio show on WRVO. She lives in Syracuse with her husband. Her two daughters go by Jaye and Em in her writing.